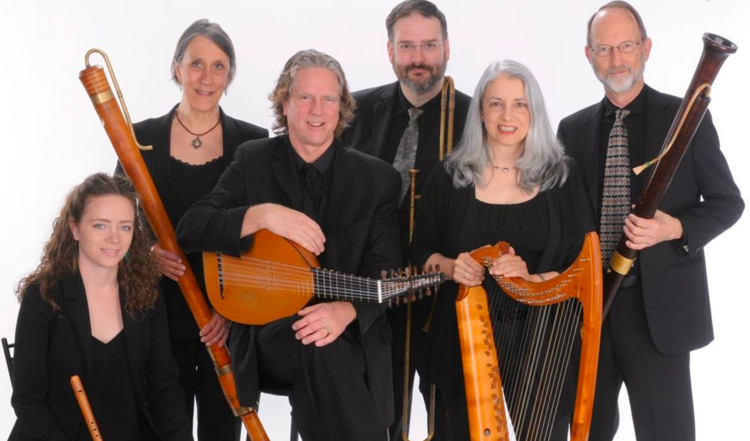 Piffaro, the Renaissance Band, has been tooting its distinguished horns (and harps) since 1980. CD REVIEW — Europeans in the late 16th and early 17th centuries were privileged to hear a treasure trove of wind music in cathedrals, courts, and town squares. 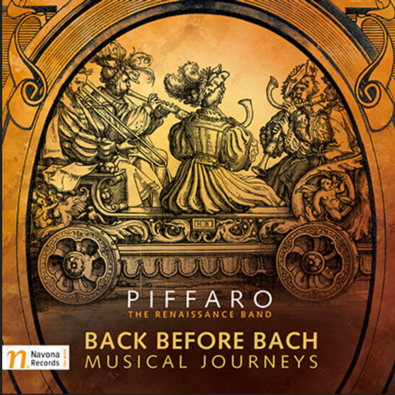 What these listeners experienced can be gleaned from the vibrant repertoire and sumptuous artistry the members of Piffaro, the Renaissance Band, offer on their newest recording, Back Before Bach. Here is a bounty of music, played to the historical hilt, that laid the basis for more than little of what J. S. Bach and others would contribute in the 18th century. 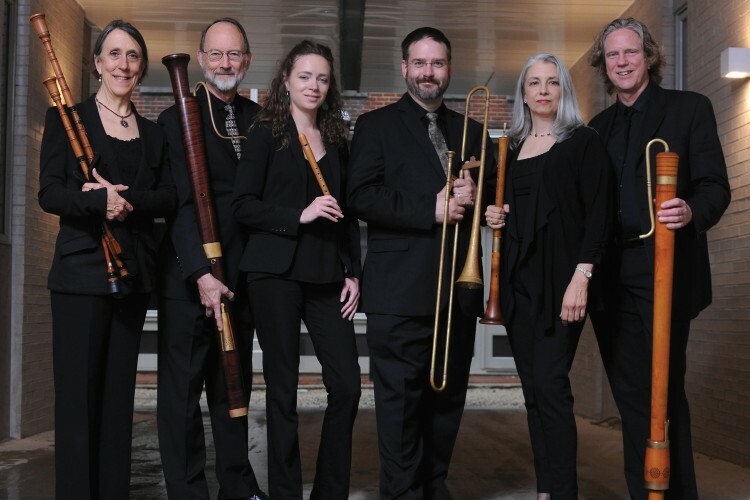 The Philadelphia-based ensemble has been exploring and reconstructing music of Medieval and Renaissance wind bands since 1980 on wind, brass, and percussion instruments, including shawms, dulcians, lutes, recorders, krumhorns, sackbuts, bagpipes, and harps. The works Piffaro has chosen for this journey through German and Franco-Flemish music gives the artists myriad opportunities to revel in the diverse colors their instruments lavish on 38 brief and varied selections. As the musicians place their stamp on pieces grouped by theme, the performances give the listener the impression of sitting in a resonant church or standing amid outdoor crowds. In the tradition of music from these periods, most of the instrumentation is left to the performers’ imaginations. Piffaro is always sensitive to stylistic implications; the players interact with seamless skill while illuminating their independent lines, notably in pieces by Orlande de Lassus, Jakob Handl, and Melchior Franck that abound in rich and surprising contrapuntal turns. Chronology plays an important role in the opening succession of pieces, providing insights into the developing harmonic language during these eras. Seven settings of the German East hymn “Christ ist erstanden” — two each by Heinrich Isaac and Johann Walter for different complements — lead up to Bach’s magisterial version as the chorale BWV 276. 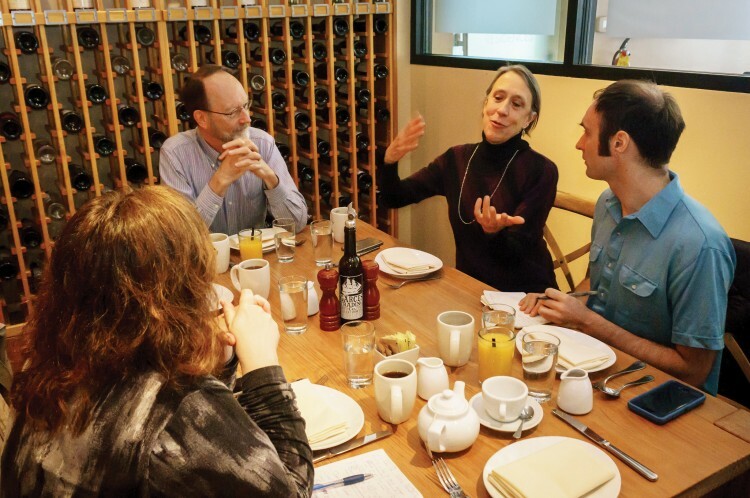 Piffaro’s Robert Wiemken, Grant Herreid, and Joan Kimball. Piffaro demonstrates its special rhythmic vivacity to sonorous effect in suites of German dances by Johannes Ghro, Michael Praetorius, Samuel Scheidt, and Johann Schein. The textures are alternately silken and rustic, thanks to the combinations of bagpipes, recorders, shawms, sackbuts, dulcian, and tambourine. A collection of German songs receives such expressive treatment that one almost has to wonder if human voices could do better. Some of the most affecting ideas are packed into a compact series of psalms, motets, and chorales on “A solis ortus” and “Christum will sollen loben schon” in which recorders and the occasional harp create an aura of glowing reverence. On a much earthier scale are four settings — among them arrangements by Piffaro artistic directors Joan Kimball and Robert Wiemken — of popular songs that spring to life through the stentorian personality of bagpipes and reedy buzziness of krumhorns. Donald Rosenberg is editor of EMAg, The Magazine of Early Music America. The 400th anniversary of the death of Miguel de Cervantes gives us the chance to marvel once again at his most amazing creation: Don Quixote, four centuries old and going strong for every one of them. Since its first appearance in 1605 (Part I) and 1615 (Part II), the novel and its addled knight-errant have been fixtures in Western culture, inspiring operas, ballets, plays, music, movies, musicals, stories, and novels, as well as tributes from Franz Kafka, Jorge Luis Borges, and Anthony Burgess to Georg Philipp Telemann, Richard Strauss, and Monty Python’s Terry Gilliam. A production of Man of La Mancha is probably playing within a hundred-mile radius of you right now. But one place where Don Quixote hasn’t gained much hold is in early music in America. Given the era, you’d think Quixote would be low-hanging fruit. But that hasn’t been the case. While the other great Western writer who died on April 23, 1616—Shakespeare—enjoys a high profile in early music, Cervantes doesn’t. Which is puzzling, given that music fills Quixote. Practically every character bursts into song, even prosaic Sancho Panza. Every big scene contains music—and Cervantes doesn’t just include it, he also stage-manages it with the kind of fussy specificity that lets you know how much it means to him. He doesn’t simply tell us that there was music at Comacho-the-rich-farmer’s wedding celebration. He also tells us that it included a “variety of instruments, flutes, tambors, psalteries, flageolets, tambourines and timbrels.” (Don Quixote, translated by Edith Grossman, HarperCollins, 2003; II 19, p. 582). No, late 16th- and early 17th-century Spanish—teetering between Renaissance and Baroque—doesn’t get a lot of play. For one thing, there’s the language. You don’t find much Spanish on the concert stage. Then, there are all those instruments. Few groups have the instrumentation and expertise required in reeds, brass, plucks, strums, and percussion. And it’s out of the mainstream. Even in its heyday, Spanish Golden Age music was obscured in greater Europe by the French, Flemish, and Italian stylistic juggernauts, although it was huge in the New World and other Spanish possessions. Enter Philadelphia’s Piffaro, The Renaissance Band. The ensemble’s interest in the music of Spain has been a touchstone over its thirty-plus years of operation. Presenting “The Musical World of Don Quixote” on October 8 and 9 will be a chance for the musicians to continue a long-time fascination with these Spanish treasure-troves—and to provide a worthy acknowledgement of the major role of music in one of the fundamental texts of all time. 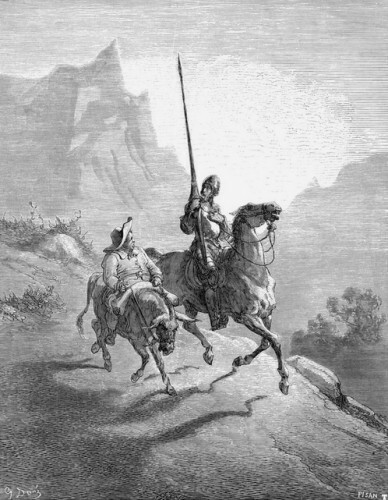 The program offers a tour through The Ingenious Gentleman Don Quixote of La Mancha Parts 1 and 2 all the way from “Somewhere in La Mancha, in a place whose name I do not care to remember, a gentleman lived not long ago…” (I I, p. 19) to the final, farewell “Vale” (II 74, p. 940). Soft and loud woodwinds, brass, guitar, vihuela, and harp will be provided by Piffaro’s core group: Joan Kimball and Robert Wiemken, co-directors; Grant Herreid, also director of the project; and Priscilla Herreid, Greg Ingles, and Christa Patton. Soprano Nell Snaidas, the male vocal ensemble New York Polyphony, guitarist Charles Weaver, early brass specialist Eric Schmalz, and percussionist Glen Velez will join them. The project is made possible with support from The Pew Center for Arts & Heritage. “…a little before the approach of dawn a voice so musical and sweet reached the ears of the ladies that it forced them all to listen attentively…No one could imagine who it was that sang so sweetly….” (I 43). Once pointed out, it is impossible to miss how thoroughly song saturates Don Quixote. There are well over 20 references to specific songs in the novel, from off-hand quotes of phrases or lines to entire episodes narrated through old ballads, or romances. It’s a pity that so few of them survive. “We can find some of the ballads in settings from vihuela books published in the 16th century,” says Grant Herreid. Composer Alonso Mudarra set a sonnet by Garcilaso de la Vega, for instance, “Por estas sperezas se camina…” (It is by rugged paths like these they go…), which Don Quixote quotes to his niece to keep her to the straight and narrow (II 6, p. 495). But music to many of Don Quixote’s song references is lost—mostly. Those hints and suggestions that remain tantalize Herreid and have sent him on years of sleuthing. As far back as the 1990s, he immersed himself in what remains of an enormous output of Spanish Renaissance song, dance, and improvisatory patterns. It’s been a focus ever since, shared with Piffaro, other groups—such as Ex Umbris, which he co-founded—and his students at Yale. At this point, his brain is a teeming repository from which he has managed to retrieve some of the novel’s key musical moments. Take the chain gang. On the road (I 22), Don Quixote and Sancho Panza run into galley slaves on the march and are indignant to discover that one of them is being shunned for “singing.” The convicts actually mean that he squealed, just like in old gangster movies. The episode started clicking for Herreid, who recognized the reference not only to the specific song, the “Romance de los Presos” (“Ballad of the Prisoners”), but also to the song type of jácara, an interlude of what Herreid calls “rather macho verse”—an effect Piffaro will be pleased to apply in performance—common in the public theaters of Madrid and Seville. Bringing back the cultural context also vividly brings back a sense of the era’s musical world. Don Quixote isn’t only full of instrumental music. It figures in practically every big scene: playing music, dancing to music, listening to music, hearing musical sounds. Cervantes specifically mentions or even lists instruments more than a hundred times, from arpa (harp) and pandero (tambourine) all the way to Zamoran bagpipes. When Don Quixote and Sancho Panza ride out of a long sojourn in the dusty countryside into the city splendor of Barcelona (II 61), we feel the change in location viscerally with “the sound of many flageolets and timbrels, the jingling of bells” (p. 862) and bugles, trumpets, and more flageolets pealing out from ships in harbor. composers of the time. Many are four-part polyphony, some quite elaborate. And to Kimball and Wiemken, they’ve become increasingly compelling. Piffaro plays music up to 1650, so this music lies at the very end of their chronological domain. But they’ve been creeping up on it since their introduction to early Spain during the Columbus quincentenary in 1992. 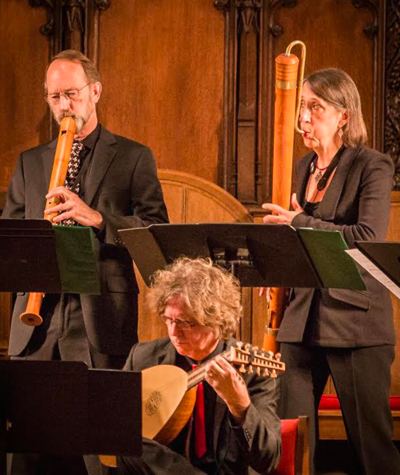 They followed the lure with 15th- and 16th-century music on their Los Ministriles recording for DGG Archiv in 1997 and 16th- and early 17th-century music on Los Ministriles in the New World for Navona in 2012. Piffaro brings in virtuoso percussionists for their Spanish programs, like Danny Mallon in 2012 and, for “Don Quixote,” Glen Velez, known as the founding father of the modern frame drum movement. New York Polyphony, with their velvety vocal sound, will alternate with the softs and louds. It makes for a colorful mix. Cervantes would approve. All early-music groups thrive on presenting the art of aristocratic extravagance within the budgets of democratic austerity. Since its beginnings, Piffaro has employed many ways to help bring out the sense of drama and occasion in performances. They recently hosted mimes in one show, performed with animated light projections in another, and last year staged Elizabethan song with audience members following them through the abandoned cells of historic Eastern State Penitentiary. For “Don Quixote,” they’re trying an open-theater experience. Presenting the show in Philadelphia Episcopal Cathedral—a large space recently renovated to allow flexible performance and audience placement—with movement by choreographer Christopher Williams and lighting design, Piffaro is planning a kind of immersive experience that the old Golden Age Spanish theater audiences would have appreciated. Cervantes’ 400th Deathiversary marks the beginning of a whole new life for Spanish Golden Age music. Piffaro plans to spread the word beyond a weekend of performances. Princeton’s Marina Brownlee, a specialist in medieval and early modern Spain, will moderate a symposium, “Music, Word and Art in the Age of Cervantes,” on October 8 (before the two concerts) at the University of Pennsylvania’s Kislak Center for Special Collections, Rare Books and Manuscripts. music; Edith Grossman, translator of the acclaimed 2003 translation of Don Quixote; Antonio Feros, historian of the Spanish Imperial era and culture; Patrick Lenaghan, Curator of Prints and Photographs at The Hispanic Society of America; and Josep Borras, bassoonist, director of Barcelona’s Escola Superior de Música de Catalunya (ESMUC), and a member of Jordi Savall’s Hespèrion XXI. 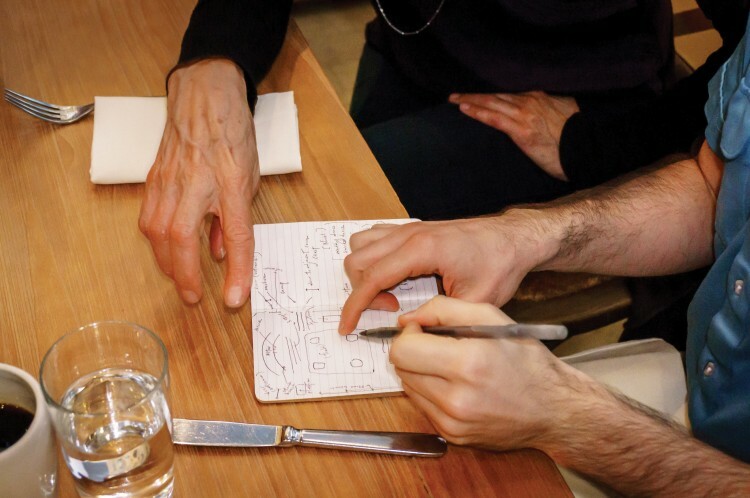 “I wish we could have the symposium next week!” said Wiemken during the winter of 2016, while he and Kimball were homing in on program selections. Fortunately, Piffaro will have plenty of opportunity to apply new knowledge and insights after “The Musical World of Don Quixote.” The October show kicks off a full season of Spain for them. In early spring, they’ll focus on Golden Age drama in collaboration with the Philadelphia Artists’ Collective, a company devoted to rare classic theater and great fans of Félix Lope de Vega and Pedro Calderón de la Barca. And in late spring, Piffaro will polish their take on the Lerma Codex, a manuscript written out around 1600 especially for the wind players at the Collegiate Church in Lerma, Spain. For Piffaro, “The Musical World of Don Quixote” is not a final word, by any means. If the group’s history is an example, it’s the beginning of new chapters, new discussions, and abundant beautiful music. “Where there is music there can be nothing bad…A flame gives light, and bonfires give brightness, and if we go near them they can burn us, but music is always a sign of cheer and rejoicing,” says Sancho Panza (11 34, p. 690). He can be the eternal optimist. But for the fifth century of music of the Golden Age of Spain, he may well be right. Anne Schuster Hunter is a writer, art historian, and teacher of creative writing who lives in Philadelphia.